July 19, 1998: Third text promo is "Unlimited Time Offer: 'All-you-can-eat' AOL, $21.95/month." I don't remember if I wrote that gem solo or in consultation with the member marketing folks. Note that we're also still pitching 100 free hours in your first month (in the right column). ¯\_(ツ)_/¯. 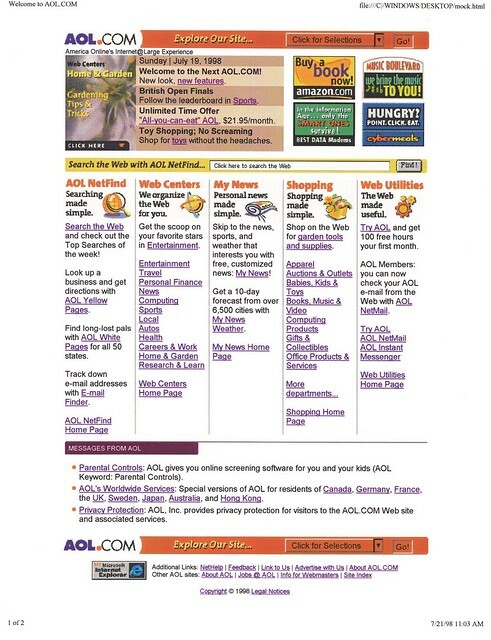 Also in the right column, check out the AOL NetMail promo. A lot more about Netmail in the coming months.